Hi everyone, thanks for stopping by today as we kick off our Intros for August! The first one up is the nerdy and fun Page Huggers. This set is a bit unique as the coordinating dies will cut right under the paws of each animal creating a flap for you to hug, hang or tuck. How fun is that! You can use them as bookmarks on books or planners, you can have them stack on top of one another, or just have them hang out on your card front -- so many possibilities! 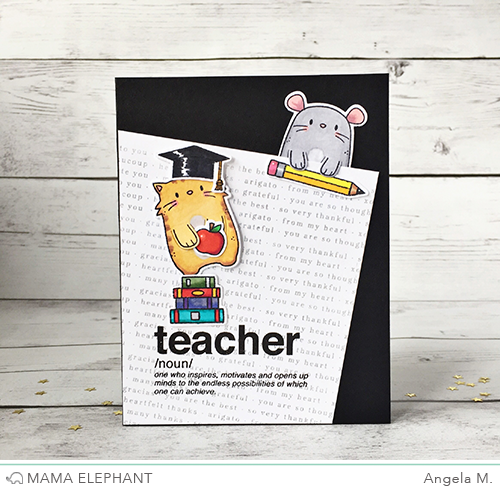 This card by Angela shows how the mouse can hang on a page AND hold a pencil! Haha! So much fun! We look forward to seeing your ideas with these cute critters! Come back tomorrow for another introduction! Please tell me that the teacher definition is in a stamp set...!!! So cute! These are very cute! Can't wait to see what else you have! Oh, I'm in love! This is the most adorable set! Such a clever idea! Cuteness galore! Cannot wait to get these!!! Oh Gosh....Super cute! It could hug anything!! Too cute to resist! These are totally cute and I love Angela's card! Such a cute card and LOVE the new page huggers!